In scientific terms, teeth are hard structures of tissue that are biologically intended to break up food, hunt prey or ward off predators. Nature intended them to be one of our most basic tools to survive, and nothing more. Dentistry has come a long way since then. Since the early days of the cave man, teeth have become part of our overall aesthetic appeal.Â A set of dazzling white, straight teeth can enhance a personâ€™s natural beauty. We spend thousands of dollars on orthodontics with the hopes of achieving a perfect smile. For most,Â practisingÂ good oral health has become part of our daily routine. 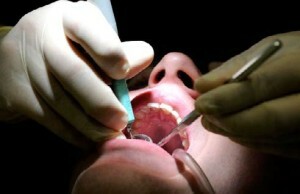 Â We now know that proper dental care can help to prevent and treat gum disease, tooth rot and other medical conditions. However, teeth have gradually become more than just food processors or an attractive trait. There are exciting innovations being made in cosmetic and general dentistry every day. Across the globe, weâ€™re redefining how we treat and care for our teeth. Across North America, a growing trend is the use of teeth jewellery. Small glass crystals, made of white gold or gold jewels, are bonded to the enamel of your teeth and made to look like sparkling diamonds. If properly applied by a dental professional, the jewels are harmless to your tooth and can stay on for up to six months. Celebrities like Pink have been seen wearing these subtle smile accessories at red carpet events. The latest statement in eco-fashion isÂ jewelleryÂ thatâ€™s not made for teeth, but made of them. Across the vast retail market of the Internet, there are several online shops selling necklaces, bracelets and rings made of discarded human teeth.Â Whether you think itâ€™s creepy or a creative use of our discarded bicuspids and molars, one thingâ€™s for sure â€“ teeth asÂ jewelleryÂ is becoming more culturally accepted. Even singer Ke$ha made necklaces, earrings, a headdress and even a bra out of her fansâ€™ teeth after making a public request for â€œbody parts.â€ Â Teeth make for a much less morbid fashion statement than fingers and toes, to her credit. Although technically classified as teeth jewellery, â€œgrillsâ€ have such a deep cultural history that they deserve their own category. Since the early 1980s, hip-hop artists â€“ and eventually other genres of celebrities â€“ have been wearing them as a status symbol of their success. Are Dental Grills Ruining Your Teeth? Typically made of platinum, gold or silver, grills can often be adorned with diamonds or other flashy gems. They come in sizes big and small, and are usually removable but can be permanently attached. 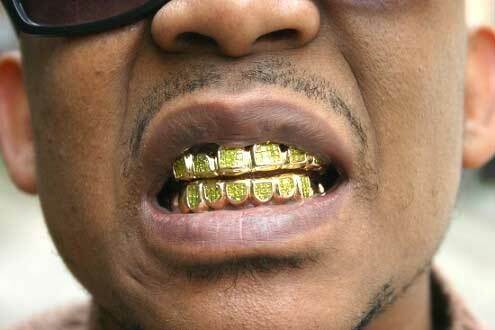 As long as theyâ€™re cleaned often and worn sporadically, dentists have found no risks associated with wearing grills.Â Eddie Plein, owner of Eddie’s Gold Teeth in New York, is credited with starting the trend in the early â€˜80s. He outfitted hip-hop pioneers like Flavor Flav and Big Daddy Kane with grills, and went on to make them for modern-day rappers like Lil JonÂ and Ludacris. After grills lost some of their popularity in the â€˜90s, they made a comeback in the early 2000s with the emergence of “Dirty South”Â rap. Grills have made several appearances in hip-hop culture since then â€“ rapper Nelly even wrote a song, â€œGrillz,â€ devoted to his â€œblinged outâ€ teeth accessories. Most notably, rapper Kanye West claimsÂ he replaced the bottom row of his teeth with diamond implants.Â Although some dentists are skeptical that he actually had his real teeth removed, itâ€™s been two years since the procedure and Kanyeâ€™s still sporting them in pictures. Looks like his song Diamonds Are Forever was a precursor to his sparkling dental habits. “Snaggletooth,” otherwise known as â€œyaeba,â€ is the latest in cosmetic fads sweeping Japan. 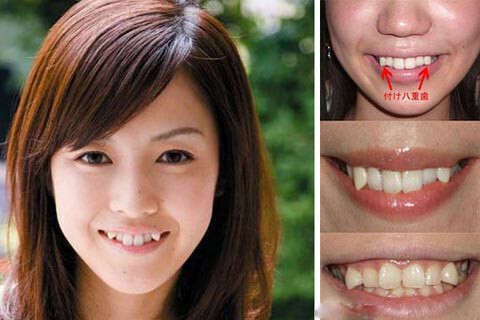 First publicized in 2011, Snaggletoothâ€™s growing popularity has been attributed to the recent trend of Japanese women wanting to look more plain and accessible for potential suitors. The Snaggletooth craze has even spawned a Japanese all-girl pop group named Tseuke-Yaeba 48, created by Taro Masuoka of Tokyoâ€™s Pure Cure Dental Salon â€“ the very same dentist credited with popularizing the procedure. For both orthodontic and cosmetic reasons, North Americans gladly pay thousands of dollars for orthodontic procedures that correct crooked teeth.Â In Japan, it can be the opposite â€“ young women pay roughly $400 to surgically whittle or sharpen their teeth to achieve an imperfect, almost vampire-like smile. Snaggletooth proves that our socially acceptable definition of â€œattractiveâ€ can be dramatically different in cultures around the world. After chipping a hole in your tooth too deep for a filling, you would normally have to wait 2-3 weeks for a dental crown to be molded, made then secured in your tooth. By the grace of modern dentistry, there is new technology that can make a crown in a matter of hours. Using CAM (Computer-Aided Manufacturing), dentists can create a crown on-site and install it the same day as the patientâ€™s visit. Â The agonizing 2-3Â week longÂ wait becomes an afternoon of minor discomfort. Scientists from the University of Marylandâ€™s School of Dentistry have created a cavity-filling systemÂ that supposedly regenerates tooth tissue and kills bacteria. Â The process involves the application of a primer, adhesive and filling that rebuilds structure lost to decay. The system uses chemicals like ammonium and silverÂ nano particlesÂ to kill harmful bacteria. This procedure isnâ€™t common practice yet, largely due to the health risksÂ associated withÂ nano particles. Using stem cell technology, researchers from Kingâ€™s College in London, UK have engineered a toothÂ made from adult human gum tissue and embryonic cells from mice. After culturing the cells to be â€œinducing,â€ the scientists transplanted the cell combination into mice with viable gum roots. Though itâ€™s too expensive and untested to work on human patients, dentists hope that the technology can eventually be used to replace their patientsâ€™ lost teeth. Â Seeing as this technology is still in its early stages and stem cell researchÂ remains very controversial, it will probably be many, many years before the procedure will be made available at your local dentistâ€™s office. Tattoos for your teeth, otherwise known as â€œdental art,”Â are custom decals, stains or designs made for dental crowns or any other variety of artificial teeth. Unlike dental jewelry, permanent teeth tattoos cannot be applied on a natural tooth, as the drilling process would be painful and harmful to the enamel. Like body art, temporary dental art is available to stick on your tooth at your leisure. Botox. Plastic surgery. Dentures? The latest anti-aging treatment doesnâ€™t involve harmful face injections or risky surgery. Experts in neuromuscular dentistry have designed dentures that re-align your jaw and facial muscles to give the appearance of a younger, wrinkle-free face. FaceLift DenturesÂ are available in select dentist offices across North America. However, if youâ€™re a dental purist and believe aging is a beautiful, natural thing, traditional denturesÂ are still offered by a dentist near you. In a world where technology gets smaller as our waistlines grow bigger, weâ€™re constantly searching for how to reverse the effects of aging, genetics or our own poor habits. It should come as no surprise that weâ€™ve found innovative ways to correct, embellish or â€œenhanceâ€ our teeth. Like any trend that defies what nature intended, it makes you wonder whatâ€™s next. Mechanical dentures that chew your food for you? Teeth TV? Itâ€™s only a matter of time before they invent an apparatus that makes your teeth self-cleaning, but until then, letâ€™s continue to brush, floss and rinse as weâ€™ve done for a hundred years. I'm a PR professional, news junkie, tea lover, tech nerd and enthused blogger for Expert Notion. You can find my Google+ profile here. Hopefully the biggest trend will be the use of the free app I have developed called Brush DJ, which aims to nudge people to improve their oral health. The main feature of the app is a timer, which plays 2 minutes of music taken at random from the userâ€™s device. This makes the mundane task of brushing for the correct length of time more fun and therefore more likely to happen. The app also contains the evidence-based oral health advice given in the Department of Health document â€˜Delivering Better Oral Healthâ€™. Reminders can be set to prompt twice a day brushing, when to change toothbrushes, visit the dentist and hygienist. The second in a series of videos showing how to carry out basic oral health tasks has just been uploaded to YouTube http://www.youtube.com/watch?v=fkq_Mjdjz6U . The next version of the app will have a link to this video and 5 others showing how to carry out basic oral hygiene tasks effectively. The video along with lots more information can be found on the website http://www.brushdj.com and on the Brush DJ Facebook and Twitter pages. Launched at the start of 2012, Brush DJ has already been downloaded in 154 countries and received mainly 5 star reviews in the app stores. Just before Christmas the app received the Dental Hygiene & Therapy award for ‘Best Dental Innovationâ€™. Grills on teeth are most common to rappers and hiphop artists.